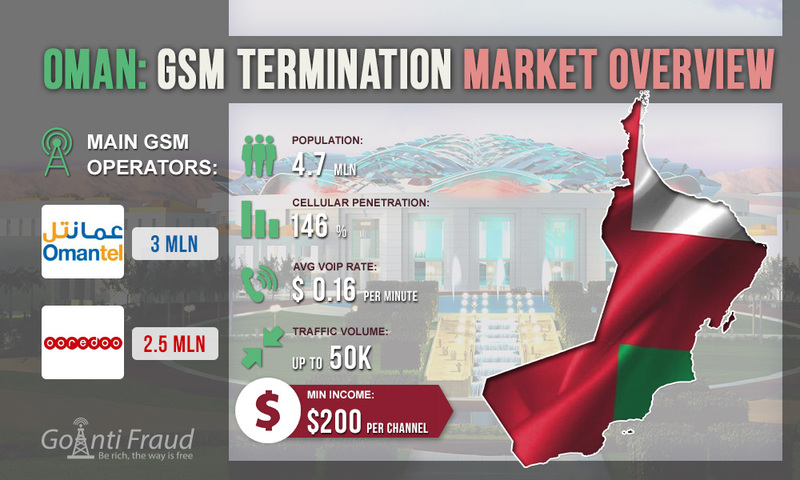 The telecommunications market in Oman is growing and progressing, especially the mobile sector. Highly competitive segment of cellular communication is characterized by a large number of connections (the penetration rate is 146% with 91% being the prepaid subscriptions, with a population of 4.7 million). These are excellent preconditions for starting a profitable business in the field of voice traffic termination. The main players in the mobile market are such operators as Oman Mobile (3 million users) and Ooredoo Oman (2.5 million users). Every year this sector of telecommunications is becoming more and more competitive, as there are two more MVNOs (virtual operators) - Friendi and Renna. The MVNO share in the mobile market is growing all the time. The cost of the SIM-card is about $5 and you need to show your passport to buy it. To buy many phone-numbers for termination, you need to contact the dealers who sell the start plans. The minute of an outgoing call in Oman costs about $ 0.07- $ 0.1. At the same time, you can find more profitable offers for prepaid subscribers. Thus, with average oman voip rates of $ 0.16 per minute of conversation, the minimum earnings of the terminator will be $200. It should be kept in mind that Oman has a law that prohibits the VoIP-communication in the country. Therefore, when converting VoIP calls to GSM format it is important to mask the traffic. GoAntiFraud clients can use the SBO traffic optimization software module, which allows to encrypt the data. This way the activity of the terminator remains invisible for the Internet provider.